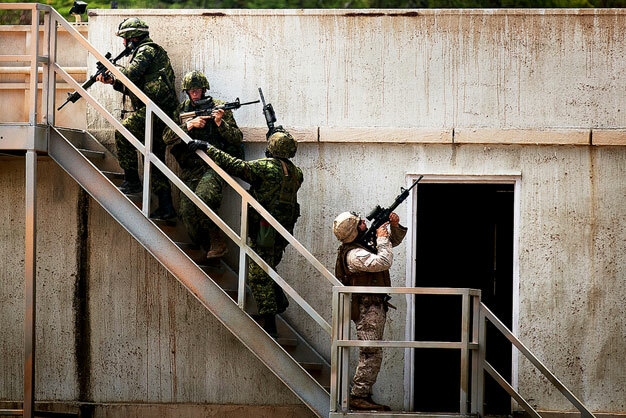 Soldiers from the Canadian Army, Princess Patricia’s Light Infantry Regiment, 2nd Battalion, and a US Marine move in as a fireteam to clear a roof top during a Marine Operations on Urban Terrain exercise at Marine Corps Training Area Bellows. Approximately 2,200 personnel from nine nations are participating in RIMPAC 2012 as part of Special Purpose Marine Air-Ground Task Force 3, Combined Force Land Component Command. The CFLCC is conducting amphibious and land-based operations in order to enhance multinational and joint interoperability. US Marine Corps photo by Cpl. Tyler Main.